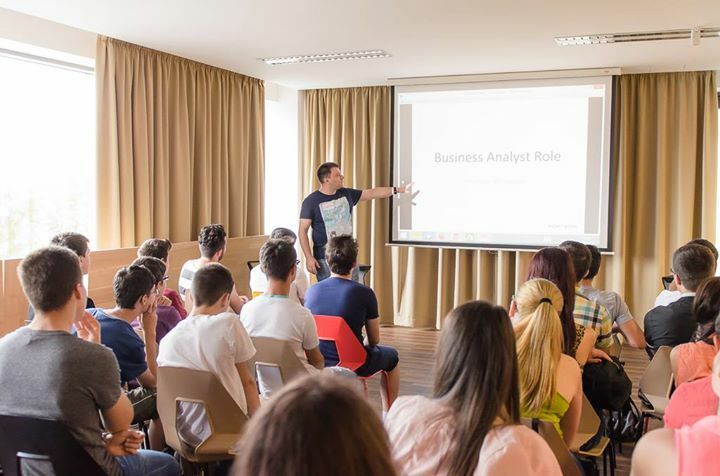 Fortech and the “Avram Iancu” high school organized this summer the IT High School Training program for students in the 9 to 12 grades interested in unlocking the secrets of Information Technology. A series of practical workshops is being offered in this program from July 22nd to September 15th by teams of trainers that include teachers of Computer Programming and Fortech specialists. Our colleagues from Fortech were more than enthusiastic to share their work experience and know-how with the passionate kids. The venue for the training sessions is Fortech’s colorful and inspiring training room, which can only add to the learning experience. The participants could choose from over 55 topics covering technical topics and soft skills like graphic design, mobile application development on iOS and Android, Agile concepts and time management. Students were offered the possibility to register for the workshops they considered interesting. Waiting lists have been opened for the most popular topics, so everyone could take part in the workshop. We hope we gave high school students a unique and useful learning experience and helped them discover how a friendly and at the same time professional work environment looks like. Fortech’s IT High School Training is only at its first edition. With the support of our colleagues and of our CEO, who considers education the key factor to our country’s economic and social progress, the program will continue for many years to come.